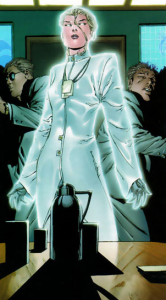 Powers: Emma Frost’s powers allow her to transmorph into an organic diamond. Emma Frost was a mutant who transformed her skin into diamond but was not a telepath in this reality. The former student and romantic interest of Professor Xavier expressed her passion in teaching the next generation of mutants, but Xavier’s aggressive ideologies caused Emma to make her own team. Emma gave peaceful lectures in Chicago, which caught the interest of the U.S. government. Under the government’s supervision, Emma created the New Mutants, who would act as public relations for the government, to positively educate the public about mutants. During the New Mutant’s first media appearance, Sentinels attacked the team. The X-Men stopped the Sentinels, and Xavier offered Emma a chance to be a part of the X-Men again. Emma refused the offer and decided to go back to Chicago to open the Academy of Tomorrow. She also cut her ties with the U.S. government and began to show hostility towards humans after event with the New Mutants, even though her new academy accepted all people and not just mutants. After the Hellfire Club captured Jean Grey and unleashed the Phoenix Force, they reappeared in later issues where Emma was revealed to be a part of the elite group. The X-Men were fighting Apocalypse, though, so no further information about Emma’s ties with the Hellfire Club has been given. 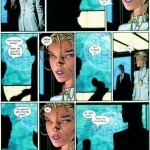 When the Ultimate universe wrapped up in “Ultimatum,” Emma Frost was blown up by Multiple Man in issue No. 3. Most of the characters in the Ultimate universe suffered fatal blows and died as well. Emma Frost can be seen in the Ultimatum’s obituaries.